Tulasi Ramayan has a line about the illustrious Raghuvansha, Pranjaye par vachan nahi. How much of it was honoured by the Raghnuvanshi’s is another conversation. 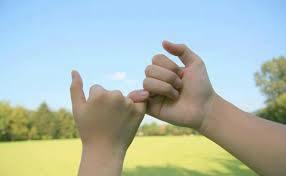 But actually a promise made , a sacred vow, once spoken becomes part of our existence for ever more. Speech is a vehicle for vows, sometimes; I think speech belongs as much to the listener as it does to the person who speaks it. When we make a promise with all integrity a subtle yet powerful shift takes place in our souls, where intentions are housed. A vow is tool we employ to facilitate the transformation within ourselves this is an expression of both our commitment and our will. So when we take an oath we communicate our commitment both to our inner self and the universe. to ensure that this is met we are no doubt challenged by our inner self being able to honour our words despite rebellion from our ego is personal growth. As we speak a vow aloud rather than reciting it in our minds, or recording it on paper, our voices project our promises into the deepest reaches of the universe. a vow conceived and pledged with sincerity encourages commitment and dedication. The presence or approval of a spiritual teacher is not necessary to ensure its completion. Honouring and completing our pledges are personal; they are also a test of character and will. Broken vows are very much like broken mirrors. They leave those who held them bleeding and staring at a fractured image of themselves. True. Takes a lot of strength to act on our own utterances. Very Well said Parwati. Loved this post. Next PostNext Deepavali-Campus and crackers.